Cali, 53, has been entombed in a coveted spot on the lower level of the extravagant Hillview Mausoleum in the Moravian Cemetery in New Drop. The cost of his crypt and the quiet funeral service was $45,000 which was reportedly paid with a suitcase full of cash. Nearby lie other former bosses including Paul Castellano, who was gunned down in 1985 in an infamous ambush outside Sparks Steakhouse. He lies in a second-floor crypt in another mausoleum. In a nearby plot is the grave of Thomas Bilotti who had driven Castellano to the steakhouse the night he was murdered. He was gunned down getting out of the car too and the grisly scene was photographed shortly afterwards. Bilotti's grave is among others in an open part of the cemetery. 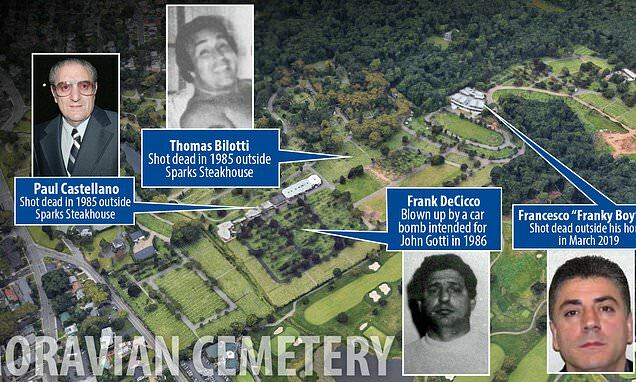 Their deaths were ordered by the ambitious late boss, John Gotti who died in prison in 2002 and is in a different cemetery. Gotti plotted their deaths as part of his takeover of the family after the death of boss Carlo Gambino. To his dissatisfaction, Gambino had appointed Castellano as his successor when he died in 1976.